His Holiness's most recent visit to our dharma community came in 2007. 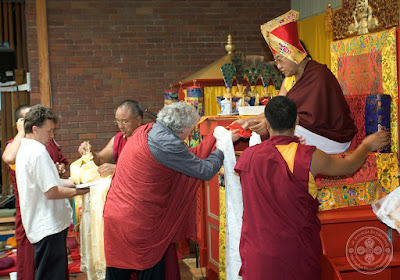 His Holiness visited Sakya Thinley Rinchen Ling to bestow a series of teachings. His Holiness gave a public teaching on the first day, followed by the mandala initiation of Rigsum Gonpo and the initiation of 21 Taras from the lineage of Atisa. At the conclusion of the teachings, His Holiness gave an inspiring discourse on the transmission of dharma to the West which we have extracted in full below. 'Buddhism came from India where all the past Buddhas, the present Buddha, and also the future Buddhas attained enlightenment; also all the great masters such as the 84 mahasiddhas came from India. From the great Indian masters the Tibetan translators learnt and then brought Buddhism to Tibet. 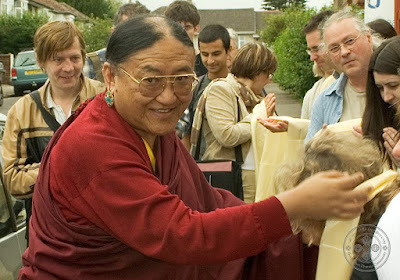 Actually - although Buddhism spread to many countries - through the great blessings of the Indian masters as well as through the great hardships of all the Tibetan translators, only to Tibet was it possible to bring all the traditions such as the Hinayana, Mahayana, Vajrayana and also all the other sciences. When new teachings come there are always problems. In the beginning there were a lot of disturbances by the local Tibetan spirits. 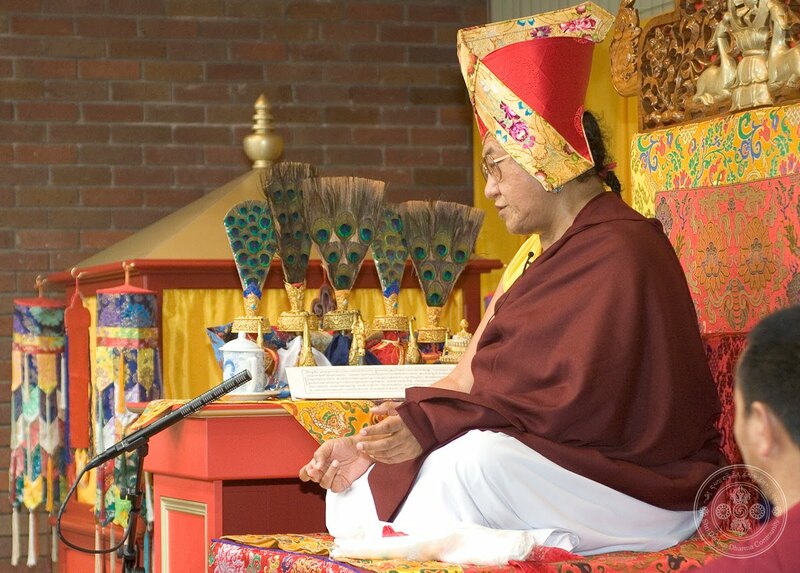 Then Guru Padmasambhava came and subdued all the evil ones and the good ones were converted into the Buddhist protectors and so Buddhism was established. Then again there came a degeneration and there were many mistakes. So great masters such as Palden Atisha came and made all the corrections and thus was established the pure Buddhist teachings. Not only through study but also through meditation many great masters accomplished realisation in all the Tibetan traditions. Even as late as the last century there are stories about some masters accomplishing the rainbow body. Now it is coming to the West and of course it's in the beginning stage; but nonetheless it is encouraging to see that so many people are seriously interested. At the same time, of course, there are some people who - mainly, I think, because of the lack of knowledge - are not practising so purely. But eventually I'm sure this will all be cleared and that Westerners will be able to carry on the teaching and establish it firmly and spread the Buddhist teachings. 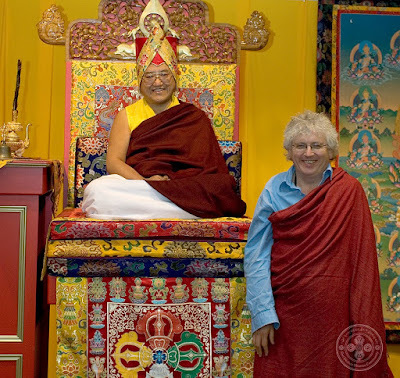 I've known Lama Jampa Thaye for over 30 years and he has been for many years carrying on the teaching programme and translations as well as practising. I find that he's very traditional and the way that he presents the teachings is very authentic. He is very good and so we are all very happy about the way that the centres are functioning under him. 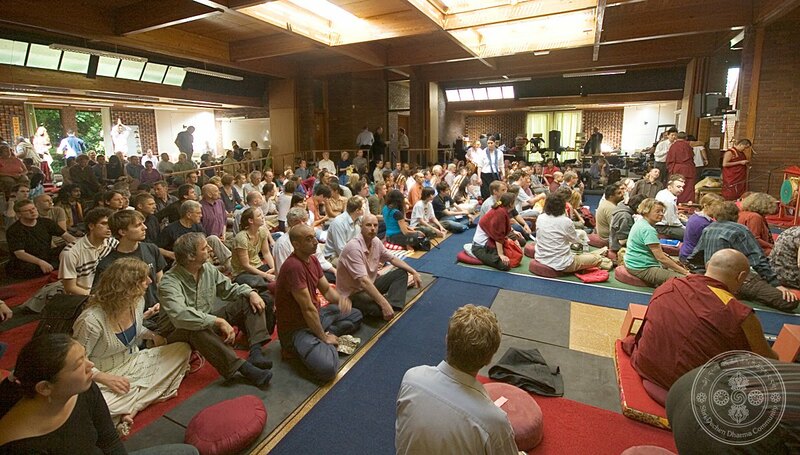 Whether one practises dharma or not is the individual's choice. The Buddha himself said that I have shown you the path of liberation but liberation actually depends on one's own efforts. So if one chooses to follow the Dharma path it is very important to do it in a pure way; not mixing it with different kinds of things, but practising traditionally and in an authentic way. Dharma is very important, the most important thing not only for this life but for many lifetimes. 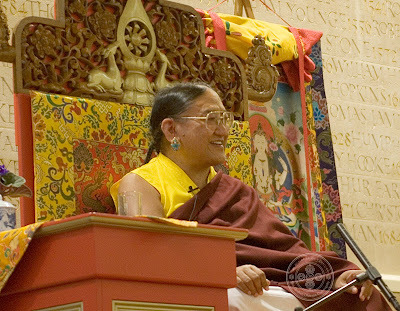 So therefore I wish to appeal to all the students to follow the Dharma in a pure way. Pure way means first of all, as the great master Vasabandhu said: based on sound moral conduct there is study, contemplation and meditation. This structure is I think common to all the Buddhist traditions. The first thing is to have good discipline. So you have all received the vows - the Pratimoksha, Mahayana and Mantrayana vows - keeping these is the good moral conduct. Then based on that, study. You have to study very carefully; without study one can't practise. So first you have to study, especially the important pith instructions. And then contemplate and analyse them. Then eventually, of course, the main purpose is to meditate. Through meditation one gains the result. And if we make the effort, there's no reason why we can't succeed because the earlier masters also in the beginning were ordinary persons like us, with obscurations and so on, but they practised dilligently and so they succeeded. So we also have the same teachings, the same methods and the same practices, so if we make the effort, there's no reason why we can't succeed. Due to our own merits and prayers we have been able to obtain this precious human life, and not only a human life but all the prerequisites, all the facilities and all the opportunities to practise the precious Dharma. So while we have all this opportunity and while we are still young and healthy, it is very important not to waste it and to at least reach certain steps towards enlightenment. So if we could do this then of course our precious human life has been meaningful and important.